WWE rolled into Los Angeles for the third time of the year, RAW was headlined by a tag team encounter as Universal Champion Kevin Owens teamed up with Chris Jericho as Jeri-KO to face current Tag Team Champions The New Day (Big E & Xavier Woods). 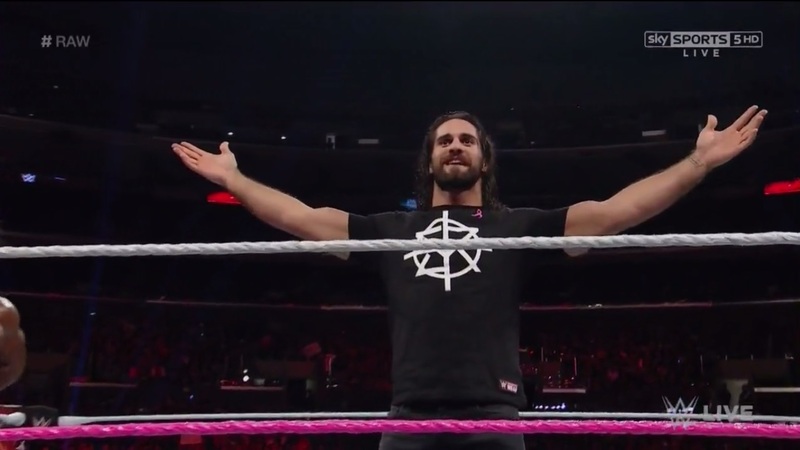 With Sasha Banks, Seth Rollins, Rich Swann, Tony Nese and Brian Kendrick featuring in major spots on the card, how would this trip to the Staples Center live up to Los Angeles classics like WrestleMania 21 and SummerSlam 2013? The lesser spotted duo of Big E & Xavier Woods managed to overcome Universal Champion Kevin Owens and "Y2J" Chris Jericho in the defacto main event, despite not having tagged on TV since May! This was a well-crafted tag clash, paced just right that it remained entertaining either side of the break, as both teams slotted together nicely. Jeri-KO worked well when in control, with Owens hamming it up on the number of occassions, like mocking Woods as he reached for the hot tag. It's a shame that Owens can't seem to get the heat that his performances deserve, as the vocal portion of the fan-base almost always cheers his actions, because they are so bloody entertaining. The build to Woods' hot tag to Kingston was great stuff, as Owens' #1 Contender Seth Rollins' music hit, distracting the Universal Champion and flowing wonderfully into a barage of belly to belly suplexes from E. Rollins would also get involved in the finish, jumping on the apron as Jericho had Woods locked in a Liontamer, meaning that after a bit of back and forth, New Day got the win with the Midnight Hour on Y2J. The result and events seem to leave a couple of options open over the two weeks building towards Rollins and Owens at Hell in a Cell, whilst also elevating E, Kingston and Woods even further. 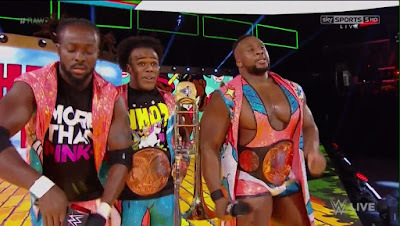 The New Day v Jeri-KO bout was put together earlier in the show, as E, Kingston and Woods interrupted Jeri-KO after the villains had mentioned the possibilities of going for the tag team titles. This produced one of the best talking segments on WWE television in recent memory as all were on stellar form, creating issues out of thin air and being incredibly entertaining whilst doing so. The beginning with Jeri-KO explored a number of storyline possibilities, as Owens suggested Y2J be the referee for a title bout with Seth Rollins, before Jericho would shift the conversation towards the tag belt, with the cracks beginning to show when Y2J proposed that he could perhaps put his Universal title he could always go after Owens' title instead. Once New Day came out on the stage, the five guys seemed to bounce off each other, as both teams digging into the verbal bag of tricks. Jericho ran riot with his list gimmick, Owens' deadpan delivery was perfect for questioning the sancity of Booty-O's cereal, whilst New Day were their usual happy-go-lucky selves as well as bringing a new "Team Huddle" idea to their gimmick. The segment concluded robustly as Owens said that New Day had "jumped the shark" and had a wonderful back and forth with Woods, where both men showed a promising amount of chemistry, before the tag match would be confirmed. The show closed with Sasha Banks winning the Women's Championship for the second time after submitting Charlotte with the Banks Statement, following a superb contest. Easily the best match on the show, this featured some great storytelling, some very good wrestling and a wonderful finish. Banks' selling of the back, following being tripped on the top rope, was consistently strong, adding genius touches like stretching her fingers to suggest nerve damage, whilst The Genetically Superior Athlete focused in on the injury with a number of interesting holds, including a modified Camel Clutch in the ring ropes. The narrative brought us the best moment of the match, as after Charlotte dug deep and connected with a corkscrew moonsault to the floor, Banks would roll into the ring and whilst the Boss grasped her back Charlotte hit Natural Selection with spot on timing. The pacing of the finish that saw Charlotte shouting at Banks to stay down before The Boss would recover quickly getting a headscissor into a Banks Statement before holding onto the move long enough to win the prize. With an extra five minutes (minimum, I think it could have actually been given another ten or fifteen minutes and not been hurt) and the removal of a couple of slip ups, I wouldn't have thought twice about given this bout the full beans! At the other end of the show, United States Champion Roman Reigns, "The Ravishing Russian" Lana and "The Bulgarian Brute" Rusev opened the evening in a storyline advancing segment that lead to a Hell in a Cell bout being booked between Reigns and Rusev on 30th October in Boston, Massachusetts. Having Lana interrupt Reigns alone, produced a different dynamic, whilst also meaning that Reigns wasn't left exposed on the mic on his own for too long. Lana played her part much better than I was expecting, appearing genuinely emotional at the lack of respect that she perceived that her husband had been shown, adding extra dimension to the feud, that very well could be the missing piece of the puzzle. The pair's brawl around ringside and through the crowd was fun stuff, but whilst the conclusion that saw Reigns blindside Rusev on the ramp with a Superman Punch got a decent pop, I found it hard to buy that Reigns was capable of taking a multiple kicks and being thrown into the steps and barricade, before legging it up to the stage within minutes, but Rusev was left lying for an age after a Superman Punch. A spear onto the hard floor I perhaps could have bought, but an otherwise strong opening segment was harmed by having The Big Dog look so much stronger than the Bulgarian Brute once again. 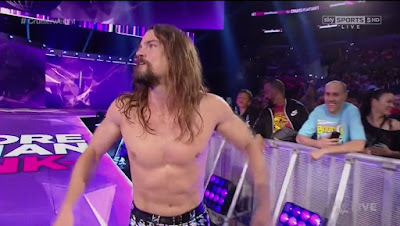 The opening match saw Brian Kendrick pick up a victory over Cruiserweight Champion TJ Perkins in an improved version of their bout from 25th September. The story told in this one was simple but effective as Kendrick developed his veteran, win at any cost gimmick and Perkins face shine was much pacier and exciting than the previous encounter. The moment where Kendrick took control of the match was a particular highlight, as he trapped Perkins fingers in the turnbuckle, before dropping neckbreaker across the metal part of the buckle. I'd have liked to have seen The Fil-Am Flash's neck play more of a role following this as it could have played into Kendrick's finish The Captain's Hook (Grounded Reverse Chinlock), however I think that perhaps keeping things simple and flashy in these early Cruiserweight bouts is definitely the route to go down as the characters and performers introduced (or reintroduce) themselves to the audience. The Wizard of Odd getting the win through various underhanded means (Eye rake, ref push etc.) advanced their issues between each other, giving Kendrick a claim to a future title rematch, whilst also beginning to cultivate some empathy between Perkins and the wider WWE audience. Rounding out the top of the card was another Cruiserweight division clash with WWN's Tony Nese picking up his first win since the Cruiserweight Classic 1st Round, as he perhaps surprisingly he defeated WWE contracted Rich Swann. Even more surprising was just how much the presentation was all about The Premier Athlete. From in-vision promo during his entrance to the sheer volume of offence he got in on Swann, it was clear that WWE is taking their Cruiserweight division in a different direction, trying to keep things as unpredictable as possible. The conflict was decent enough, mixing some pacey Lucha style action with hard strikes, including great sequence from Nese after he'd dodged a moonsault. It was a shame about the last quarter of the bout, which included Swann doing a double stomp to the back of Nese's neck, which ended up looking like a double footed version of Seth Rollins' banned Curb Stomp. There also seemed to be a botch in the finish as Nese was unable to catch Swann correctly coming out of a handspring attempt and weirdly moved to an awkward Pumphandle Michinoku Driver II for the pin. Luke Gallows & Karl Anderson picked up a win over The Golden Truth (Goldust & R-Truth) in a short and simple tag clash, with Gallows & Anderson continuing the beatdown post match. Enzo & Cass presented replica Women's Championship belts to three women who have survived cancer in a heart warming moment that the crowd loved. Michael Cole interviewed Seth Rollins with the Architect dazzling as he challenged Kevin Ownes to a title rematch and adding plenty of depth to the storyline and his slowly turning babyface character. Sami Zayn and Titus O'Neil had a dud of a bout, but at least Zayn went over with a Helluva Kick, in a weird moment after O'Neil had debuted a new "Brand" gimmick. A lot of this week's Monday Night RAW was pretty good this week, but then a lot of the show was also filling for time. This meant that while the main segments were all interesting, engaging and humorous (with the exception of the throwaway Nese v Swann bout), there was a bit too much stuff like Golden Truth v Gallows & Anderson and Zayn v O'Neil and that's without mentioning the squash matches for Braun Strowman and the Cesaro & Sheamus tag team. With a good deal of time given to the Cruiserweight division, it appears that WWE still seems to be finding it's feet with how it wants to present the Cruiserweight division and that's coming across in how the wider audience is yet to take to the concept or any of it's performers in any great numbers. With a few tweaks in this area and perhaps a more balanced conclusion to the Reigns, Lana and Rusev segment, then this would have been a good wrestling show. However, with just two episodes until Hell in a Cell, there are certainly worse things that WWE could be putting on in their three hour slot on USA Network than this slightly above average event!